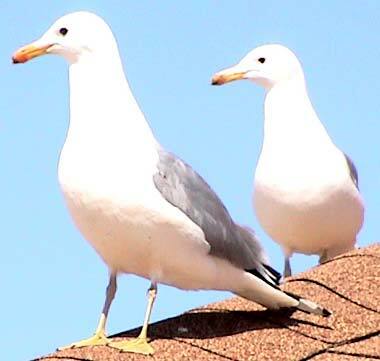 California gulls on a rooftop on Antelope Island, Utah in 2003; photo by Shengzhi Li from Wikpedia (use permitted with attribution / share alike). "The Mormon pioneers planted crops in the spring of 1848, after suffering great hunger during their first winter in the Salt Lake Valley. As the crops ripened, hordes of devouring crickets descended upon them from the foothills east of the valley. The Saints fought them with clubs, fire, and water. As they despaired of saving the next winter's food, their prayers for deliverance from almost sure starvation were answered when thousands of sea gulls came to feed on the crickets. 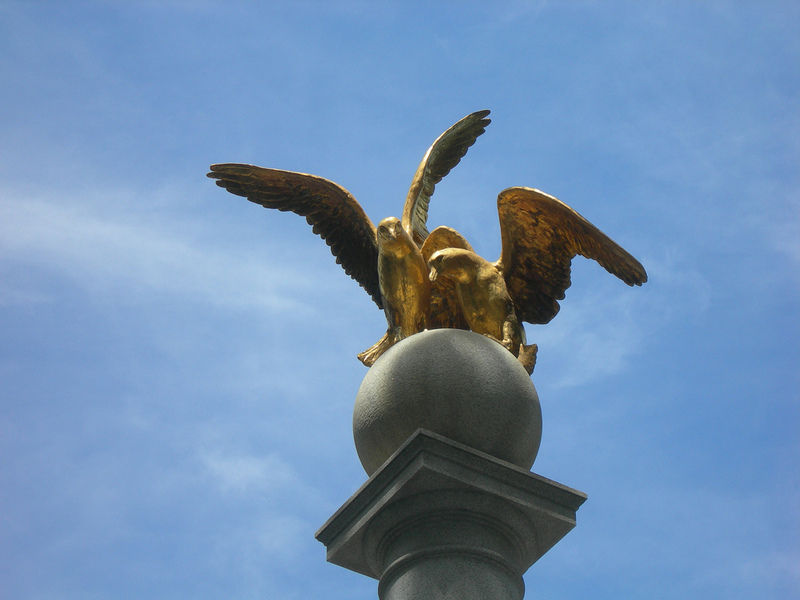 The Sea Gull Monument commemorates this modern-day miracle. 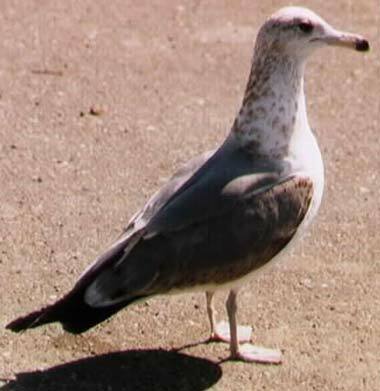 The sea gull is now the Utah State bird." California gulls are gymnasts of the sky - they perform amazing aeronautic maneuvers and sometimes appear motionless in midair by positioning themselves to catch wind currents with graceful precision. These gentle birds are considered very beneficial by agriculturalists. Golden gulls at the top of Sea Gull Monument; Salt Lake City, Utah. Photo by Jimmy Emerson, DVM/Flickr (noncommercial use permitted with attribution/no derivative works). 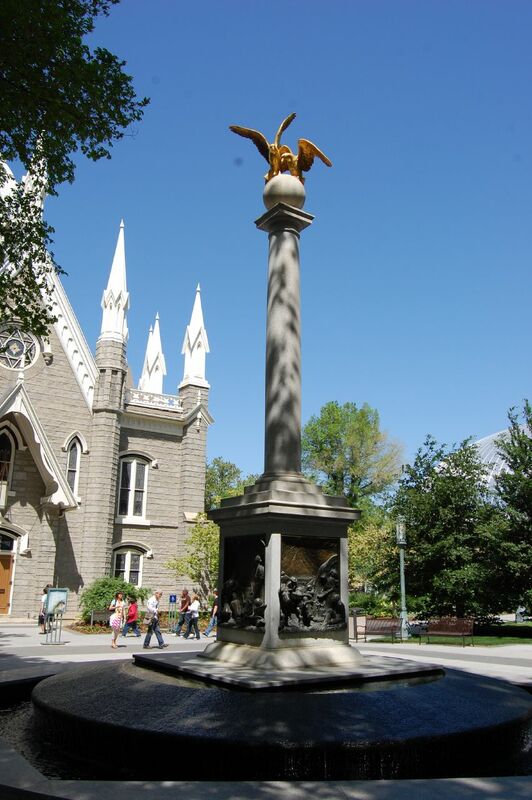 Sea Gull Monument; Salt Lake City, Utah. Photo by Ellen Macdonald/Flickr (noncommercial use permitted with attribution/no derivative works). 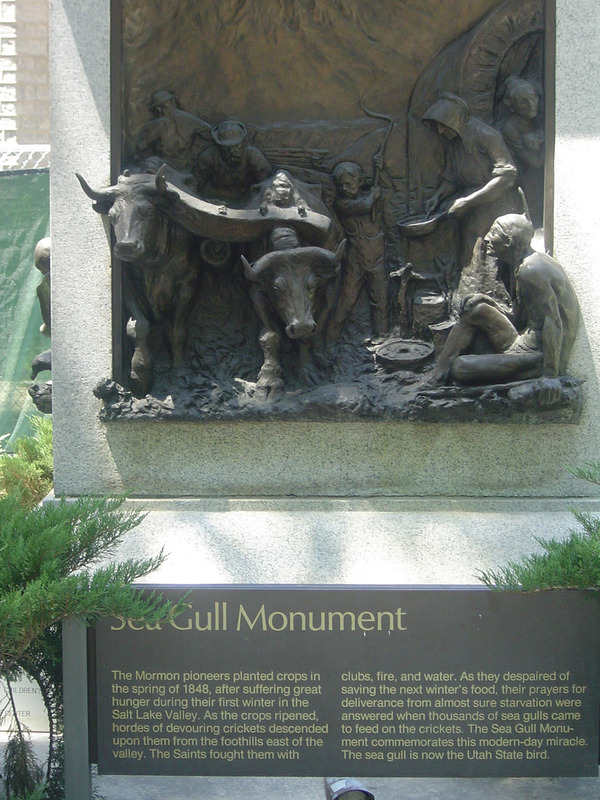 Sea Gull Monument in Salt Lake City, Utah; telling the story of the 1848 "sea gull miracle." Photo by PhosphoricX3/Flickr (noncommercial use permitted with attribution/no derivative works).